NASA’s Galileo probe has given us data about Jupiter’s icy moon, Europa. 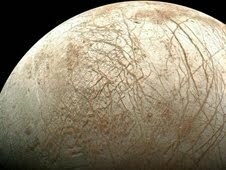 Europa is covered in water ice and is thought to have a liquid water core with more water than all of Earth’s oceans combined. Unfortunately the water core is thought to be so deep that reaching it is nearly impossible for us and would be extremely difficult for any life to make it out near the surface. New data has shown “lakes” that exist between the deep water and the surface could contain as much water as the North American Great Lakes. This discovery increases the chances that life might exist within reach of the surface and possibly within reach of our current drilling equipment. 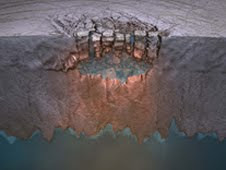 Future missions to Europa are being considered to probe the icy surface. NASA and the National Research Council both consider the search for life on Europa a high priority. Unfortunately the Juno mission which was recently launched will not study the icy moon in detail. Instead, the Jupiter Europa Orbiter is planned for a launch in 2020. Russia has also expressed an interest in sending a lander to Europa as part of an international exploration effort. This is interesting because the Galileo probe was crashed into Jupiter to prevent any contamination of Europa. It seems that we are over the possibility of infecting the oceans on Europa with Earth based life. Previous proposals have included a probe to crash into the surface, causing a plume of matter to soar into the atmosphere to be caught by an orbiting probe and a nuclear “melt” robot to probe the interior of the moon. This new discovery using old data almost pinpoints where to search for that life. These lakes are thought to be even as close to the surface as 200 meters, which is a great deal closer than the tens of miles of ice between the surface and the deep oceans of Europa. 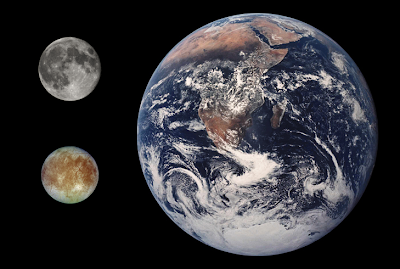 Not only do these lakes make it easier to find life on Europa but it is thought that the mere existence of these lakes could allow for transfer of life from the shallow lakes to the deep interior or vice-versa. The new understandings of the ways water and ice move on Europa has been enhanced by the increased study of Earth’s oceans, ice sheets, and ice shelves. Hopefully this concentrated effort to document the melting of Earth’s polar caps will have a large payoff when it comes to planetary science and the search for life on other planets and moons.